WWP events like these, supported by partners like DEWALT, give warriors the chance to connect with other warriors, their family members, and their communities. CONCORD, N.C. (June 13, 2017) – NASCAR gets the blood pumping for Robert Gers, an Army veteran served by Wounded Warrior Project® (WWP). The sights, sounds, and smells are part and parcel of a beloved sport – and a pastime that gives Robert and his wife, Crystal, something to bond over. Recently, they experienced the rumble of the engines and cheers of the crowd in person. 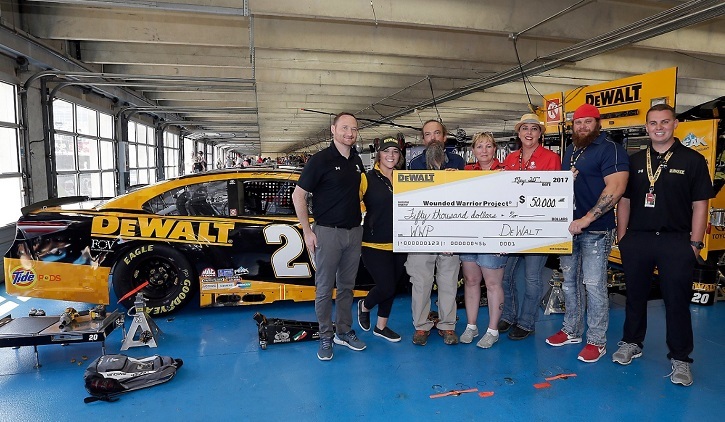 DEWALT® hosted an event in partnership with WWP, allowing Robert and Crystal to attend the All-Star Race and meet the DEWALT Racing team, including driver Matt Kenseth. WWP events like these, supported by partners like DEWALT, give warriors the chance to connect with other warriors, their family members, and their communities. Getting engaged in fun activities in comfortable environments can improve the wellbeing of warriors and their ability to enjoy camaraderie with other wounded veterans. It’s a sentiment his wife shares. When the race was over, DEWALT presented Robert, Crystal, and the other attending warriors and staff with a $50,000 check for WWP.